Ginger beer isn’t brewed. It doesn’t contain barley, or hops, and this version doesn’t even contain yeast. It’s not alcoholic. It’s not really beer, in any meaningful sense of the word beer. Ginger beer is, however, a spicy sweet-tart concoction that makes a great mixer.This version is not very sweet, as it is intended as a drink mixer rather than a stand alone beverage. If you just want to drink it as ginger beer, add a little simple syrup, and perhaps a splash of club soda to give it some fizz. Or, you could just brew a fermented ginger beer (not nearly as hard as it sounds). Here is a great version. Notes on buying fresh ginger – the heavier it is, relative to other pieces of ginger the same size the better. It’s less dried out, a little fresher. 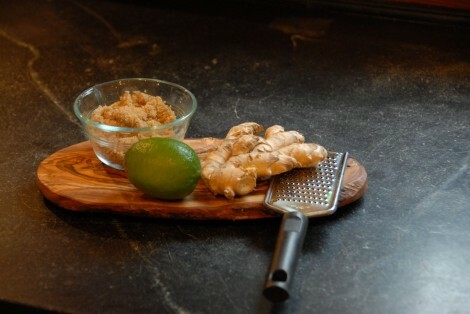 A 4 oz piece of fresh ginger should be about the size of a deck of cards. While bringing a quart of water to a boil, finely grate the ginger. I use the small hand grater in the photo – my box grater doesn’t have a fine enough mesh, and the ginger is fibrous enough that the microplane graters get a little clogged up although they are completely useable. Once the water boils, add the ginger and remove from the heat. Cover, and let stand for an hour. Mix in the sugar and lime juice, and strain through a medium or fine strainer. Press down with a wooden spoon (or your fingers) and really wring out the ginger pulp – it can hold a lot of liquid and a lot of flavor. The resulting liquid will be cloudy; that’s ok. It will also separate after sitting for a while – just stir it up before use. Store the ginger beer in a closed container in the refrigerator, and it should keep for a week or so.